Part of me wants us to be late. After all I’m in Switzerland, home to the most frighteningly efficient public transport system in the world; a country that measures just 350 kilometres by 220 kilometres but which has 5000 kilometres of railways and 13,000 kilometres of bus routes; a nation where timetables are so well co-ordinated you never have to wait more than 10 minutes for a connection; a seemingly mythical land where if a train is more than three minutes late, it’s announced as delayed. But we’re not. 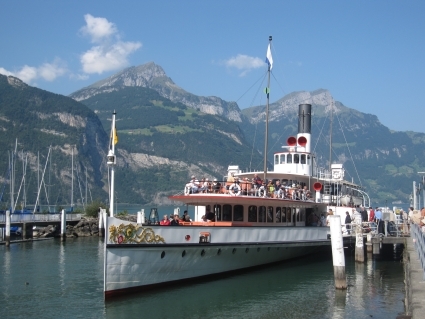 At precisely 9.12am, the Schiller paddle-steamer glides away from her dock and sets off across the still waters of Lake Lucerne. And if that wasn’t disappointing enough, the sun is shining, the water is twinkling and I’m surrounded by some of Europe’s most stunning scenery. Damn Swiss show-offs. This entry was posted in Switzerland by Rob McFarland. Bookmark the permalink.